The Louisey Rider Cup (LRC) is a day of fun, not just for skaters but for officials too. I missed out on the first LRC in 2016 (curse you traveling for work!) so jumped at the chance to be a part of the Officials crews of either Team Gold or Team Sparkly in 2017. Officials sometimes have a reputation for being “Team No Fun” and we jokingly use this to refer to ourselves (this isn’t strictly true – all officials ever want is a game to be safe and fair). LRC gives us a chance to do our roles while having a lot of fun. The day is a long one for officials even with two crews and the change over has to be swift so the games keep to schedule (big shout out to our crew and tournament heads, and event wrangler here). You might struggle to imagine an atmosphere that is both professional and a laugh, but Team Gold and Sparkly manage it. It’s an opportunity to break out the glitter and the sequins for officials who are used to trying to keep as inconspicuous as possible. It’s an opportunity to see your friends from all over the UK. It’s an opportunity to learn from some of the best officials in the country. It’s an opportunity to drink a lot of coffee. It’s an opportunity to give your time to a cause that celebrates the community that is roller derby and to fund-raise for charity. 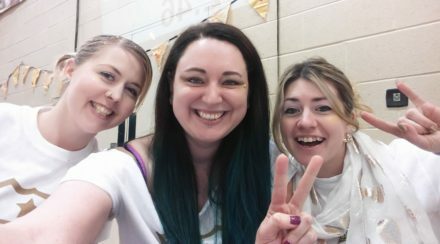 So here’s to you Team Gold and Sparkly (and to the myriad of volunteers who make it happen), in the words of the officials t-shirts from last year you are “OFFICIALLY AWESOME”.